A true success story, the bull trout population has rebounded from extremely low numbers to become one of the strongest most robust populations in the country. Lake Billy Chinook is one of the only areas where you can legally retain a bull trout. In addition to being the premiere location to catch bull trout and kokanee, there are also rainbow trout, smallmouth bass and other species in the lake. The lake is closed to all fishing from the signed point upstream, approximately 350 yards, to the cable crossing on the Metolius River. Chinook Island is a great spot to stop for a picnic and a short hike. Composting toilets are located just a short walk from the docks. The island is day use only and no anchoring or mooring is allowed from 9:00 PM to 7:00 AM. No anchoring or mooring is allowed at any time on the log booms. Open March 1- October 31. 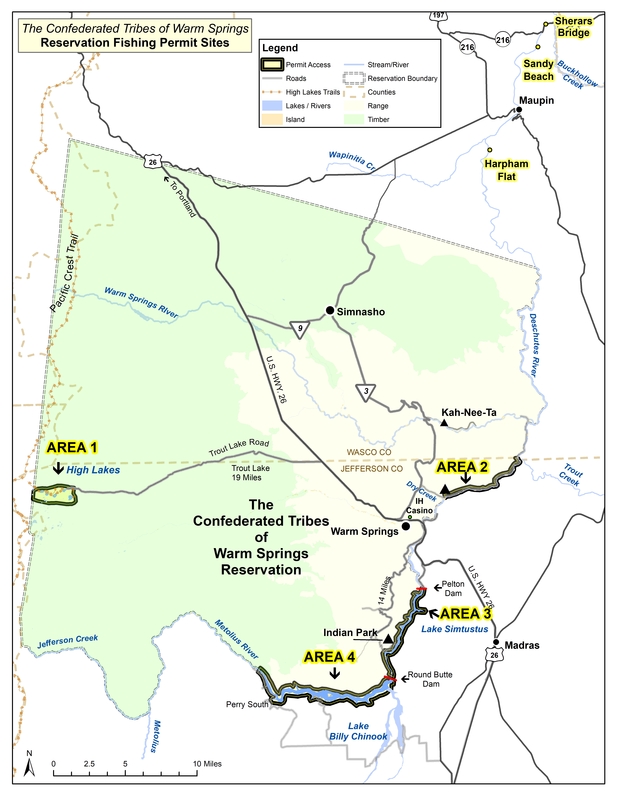 Open where it borders on the Reservation up to a point approximately 350 yards downstream from the cable crossing. Closed to all fishing from the cable car crossing on the Metolius River to a signed point approximately 350 yards downstream. (Tribal Resolution No. 9324). East Boundary: a line running from the west abutment of Round Butte Dam to the southern land point where the Deschutes and Metolius arms meet. (1) Trout – 5 trout, 8-inch minimum length, no more than 1 fish over 20 inches. (2) An additional 5 kokanee are allowed. Kokanee are included as part of the trout bag limit. (3) No bag or size limit on bass and brown trout. (5) Rainbow over 20 inches are classed as steelhead and kokanee over 16 inches as sockeye and all chinook must be released unharmed. (B) Houseboats and recreational boats are prohibited from landing, anchoring and mooring along the Reservation side (north) of Lake Billy Chinook and on other tribal lands. (C) Chinook Island is for day use only, from 7:00 a.m. – 9:00 p.m. Houseboats & recreational boats are prohibited from landing, anchoring and mooring at Chinook Island from 9:00 p.m. – 7:00 a.m. No anchoring or mooring on log boom. (D) CRAYFISH HARVEST IS PROHIBITED BY NON-TRIBAL MEMBERS. (E) Disturbing commercial crayfish traps is prohibited.